The organ for Sydney Grammar School was almost our first instrument to be built south of the equator but it was ultimately pipped to the post as the first by the continuo instrument we built for the Australian Brandenburg Orchestra. 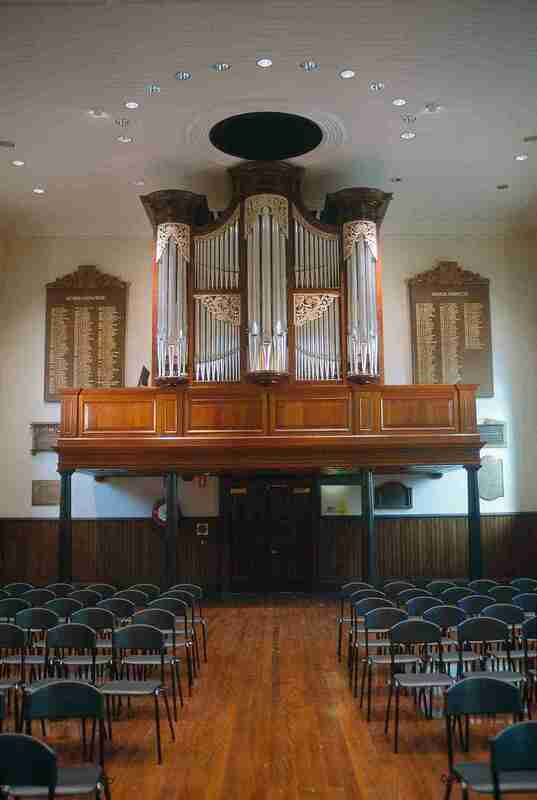 Various options were considered for building the organ on the floor of Big School before it was decided that, in spite of the additional cost of providing a gallery and the restrictions on size that implied, a gallery instrument was in fact the best option. Not only did it mean that a minimum of floor space was lost in the room, but it was also the only way that the organ could be sited to speak down the length of the building rather than across it as would have been the case had it been on the floor. Ideal as such a position is, in this instance it brought some pretty serious problems with it. The height available from gallery floor to ceiling was a mere 4.8m. That is not a lot of height for an organ of 17 speaking stops and, whilst it would have been relatively easy had the manual departments been placed one behind the other, this was felt to be undesirable for two reasons. Firstly, it would have necessitated making the gallery unacceptably deep. Secondly, in an instrument which was required to be versatile, having the Swell speaking through the Great was clearly disadvantageous. It was clear that a normal console position was out of the question so as in many Scandinavian churches, we decided to put the console on the end of the organ. This allowed the front to be taken right down to gallery upstand level. The key action therefore had to travel across the organ below Soundboard level, just the place where one would normally want to put the bellows. Furthermore, with three sets of trackers to accommodate (the two manuals and the pedals) access to the lowest trackers for assembly and any maintenance was going to be difficult. Fortunately, the gallery still had to be built so in cooperation with the architects, a design was conceived which allowed us to run some of the action within the depth of the gallery floor even passing through one of the steel beams which supported it. The panels on the underside of the gallery were made removable making access a delight. The bellows remained a problem, however, the roof space above the organ presented itself as an option and after discussions with the architect was settled upon. Placing the bellows here, rather than on the opposite side of the gallery to the console as originally proposed, not only allowed us to make the bellows much larger but also freed up space for other musicians on the gallery itself. The bellows and blower sit above the organ in a large insulated enclosure which effectively forms part of Big School itself, being open below to the room itself, ensuring that there is no temperature difference when Big School is heated or air conditioned. 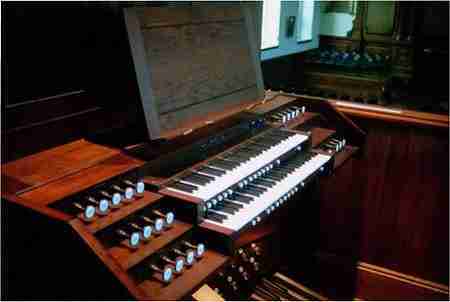 The Great and Pedal Organs are accommodated on a pair of soundboards with the basses at either end. This allowed the borrowing of some stops to the Pedal. The Swell Organ is above the trebles of the Great in the middle of the case. Of necessity, the Swell Organ is quite tightly packed, but with the swell shutters opening a full 90º and being in the front of the organ, there is no perceived hindrance to the egress of sound. Indeed, as is so often the case with such cosy swell departments, it also enhances the degree of diminuendo quite significantly. Due to lack of space, the Pedal Organ had to be modest, but to improve the flexibility of this department, four stops are borrowed mechanically from the Great Organ. The Open Diapason is fed through adjustable valves after the clack valves and before passing into a common conveyance for the first 12 notes. This allows us to feed slightly more wind into the Open Diapason when they are being used as the Pedal Principal 8 making the Pedal Principal 8 a little more solid in the bass than would be desirable in the bass of the Open Diapason. The organ is tuned to Vallottis temperament. The new organ was heard in public for the first time in a series of concerts in August and September of 2004. Each of these concerts was recorded for radio broadcast by the Australian Broadcasting Corporation and 2MBS-FM. The Anglo-Australian link was further strengthened by the guest appearance of Anne Page (formerly from Perth, Australia, now resident in Cambridge) who played the first two public recitals before concerts played by Robert Ampt and Amy Johansen (duo recital), Christopher Wrench and Philip Swanton. The organ also featured in a presentation of Monteverdis Vespers which was performed by the Sydneian Bach Choir and conducted by Christopher Shepard. Finally, there was a performance of Poulencs Organ Concerto by the school orchestra all of which demonstrated the remarkable versatility of this modest instrument. View the Specification of the organ at the Sydney Grammar School (completed 2004) and pipe scales.